We're planning on a quiet night in on New Year's eve. We already have the virgin bubbly and dessert but don't know what to eat for dinner. All the Christmas meals are still fresh in our head and we long for comfort food. C suggested I make spring rolls because he likes the way I make it. Spring rolls wrapped in crisp lettuce sounds wonderful so I said to him that I'll do the mixing and if he does the rolling and cooking, this can be done. I'm almost 38 weeks pregnant, cooking isn't something I enjoy too much at the moment :-) I just want to eat and sleep ! Less than 2 hours of prepping, rolling and cooking, we were rewarded with tasty crunchy spring rolls with tender hot meat filling inside ! oh how I miss eating them. It was so worth the effort. Hubby and kids happily gobbled them up ! Here's the recipe ! 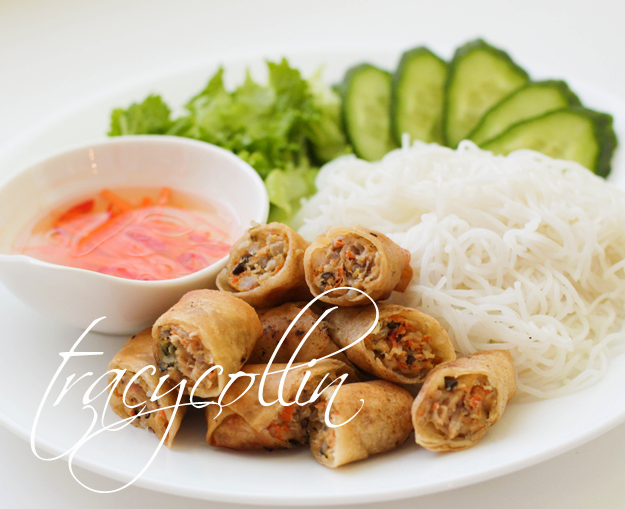 It's my own recipe as this is how I remember the taste of spring rolls in my childhood years. Hubby and the kids likes it and even my picky mom said it's good. I wanted to write this recipe for my girls as I hope they can make it and pass on to their kids. As taste are subjective, feel free to experiment with chicken or turkey, add in a little shredded jicama or taro, or omit some listed here as you like. 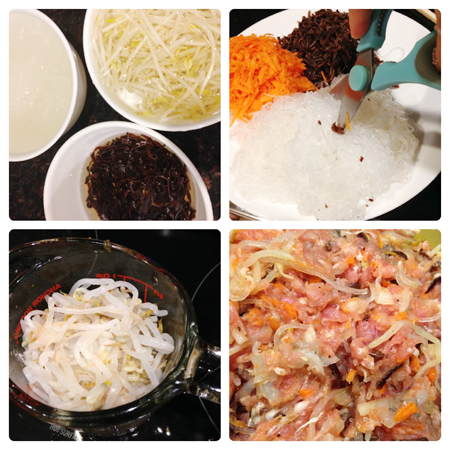 In a bowl, mix well the carrots, angel hair, bean sprouts, and wood ear mushroom together. Then add in the prawn, pork, pepper, fish sauce, salt and sugar. Mix well with your hands. I have yet to find a way to do this without using my hands. Fork and chopsticks just doesn't mix it as good as I like. Once mixed, set up a rolling station ! in a bowl, mix the lukewarm water with the corn starch, this is your sealant for the spring rolls. Repeat with the rest of the meat filling ! In a deep fryer (or a deep pot), fill with enough vegetable oil to fry the spring rolls. If using pot, fill it with at least 3 inches of oil. When oil is bubbly hot, with a thong or a pair of wooden chopsticks, slowly lower one spring roll at a time into the oil. Don't over crowd the pot, the spring rolls won't cook evenly. Keep turning them over until all nicely golden brown. Usually it takes about 5-7 min. - to test for when the oil is hot enough to fry, take a wooden spoon or wooden chopstick and stick it into the pot. If bubbles formed around the stick then it's ready ! 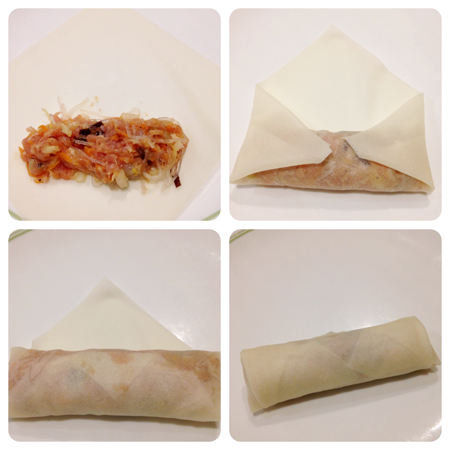 - you can freeze the rolled spring rolls for deep frying later on. Just make sure you freeze them in single layer. You can stack them in layers if you separate each layer with plastic cling wrap. If you are using other brand of pastry wrapper, make sure the rolls doesn't touch each other. This is to ensure the pastry wrap doesn't get stuck to each other and be a mess when you deep fry them. When ready for frying, remove spring rolls from freezer and you can deep fry them in their frozen state, no need to thaw. Add about two min. to cooking time. - I've also have tried deep fried all the rolls at once, save some for dinner and freeze whatever is left when they cooled down. Since they are already cooked, you can freeze as it, stacked up, no need for single layer or keeping them separated from each other. I freeze the cooked spring roll to avoid deep frying again in future that's all :) I like to snack on only a few at a times and I don't foresee myself heating up a whole pot of oil just to cook like 10 spring rolls! When anyone of our family members want to snack on them, I just pop a few in the toaster at 350 degrees for about 12-15 min and they're good to go ! Depending in toaster brand/model and the quantity of rolls you want to heat up, it might take a few min. less or another 5-7 min. to completely heat up the spring rolls. Please taste test your spring rolls for hotness.